Nuacht 24 - an cuma a bheidh ar an seirbhís nua ag Nuacht 24. As John Bowman proved, current affairs programming is essential to Irish life, writes NOEL WHELAN . Ní minic a aontaím le Noel Whelan, an trachtaire chúrsaí reatha a bhionn le clos agus le feiscint go mion is go minic ar RTÉ, ach aontaím leis an méid sin atá scríofa aige in alt inniu san Irish Times. Tá cláracha chúrsaí reatha tabhachtach i saol na hÉireann, dar leis agus é ag scríobh omós de chineál éigean do Questions and Answers, a tháinig chun deiridh an tseachtain seo tar éis do bheith ag craoladh le breis is scór bliain. Ach, is cosúil, nach bhfuil siad tabhachtach i saol na Gaeilge nó is beag an riar atá á dhéanamh ag craoltóir Ghaeilge ar bith do Chúrsaí Reatha. Anois, le h-imeacht Foinse sna sála ar Lá Nua, agus Comhar gan cuisle, is beag an riar atá á dhéanamh ar an ghoile le h-aghaidh cúrsaí reatha i nGaeilge. Seo sean phort dem chuid. Is dócha go bhfuil sibh bréan de. Ar maidin inniu, an chéad Satharn gan Foinse, tá go leor údair éadochais ag pobal na Gaeilge. Ach tá údar dóchais ann freisin. An oiread is go bhfuil na craoltóirí stát urraithe – RTÉ Raidió na Gaeltachta, TG4, RTÉ – ag teip maidir le cúrsaí reatha, tá Nuacht 24 i mBéal Feirste ar tháirseach tús a chur le ré nua don iriseoireacht Ghaeilge ar an oileán seo. Ar ndóigh rinne siad sin roimhe. Agus Lá Nua ar tí bás a fháil, bhunaigh Eoghan Ó Néill agus a fhoireann óg uaillmhianach An Druma Mór agus Nuacht 24. Anois is é Nuacht 24 atá ag iompar lochrann iriseoireacht na Gaeilge. Go fóill, mothaím gur beag an chreidiúint atá tugtha dóibh as ucht sin nó ba mhiorúilt é nuachtán Ghaeilge a fhoilsiú faoi láthair, ba mhiorúilt anuas ar sin é a fhoilsiú gan deontas d’aon tsort agus é beo ar dhuthracht is ar dheamhéin na foirne is lucht tacaíochta atá ag dul i líonmhaire go mall ach go cinnte, más aon tomhas é líon na bhfógraí in eagrán na seachtaine seo. 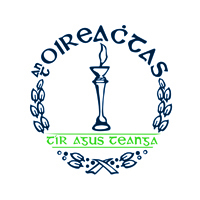 ÓN DEIREADH seachtaine seo caite níl fostaithe go buan sa Stát seo ach iriseoir cló Gaeilge gairmiúil amháin – Eagarthóir Gaeilge an nuachtáin seo. Sa chéad dul síos, ní aithníonn an abairt sin gairmiúlacht muintir Nuacht 24. Níl siad ag fáil íocaíocht as a gcuid oibre – ach ní h-ionann siad nach bhfuil siad gairmiúil. Tá gairmiúlacht agus snás ag baint le h-obair Nuacht 24 cinnte agus dhéarfainn gurb é foireann Nuacht 24 an fhoireann is gairmiúla, b’fhearr liom is éifeachtaí, a d’oibrigh ar aon meán chló Ghaeilge riamh. Agus deirim sin agus mé ag cur mo chuid oibre féin agus na foirne a bhí sé de phribhléid agam obair ina dteannta san áireamh. Tá Nuacht 24 i dtiúin leis an aimsir thar mar a bhí aon seirbhís/nuachtán chló Ghaeilge eile roimhe. Léiríonn sé go bhfuilimíd ag déanamh dul chun cinn agus nach bhfuilimíd siocaithe san aimsir chaite. Scríobhadh an abairt sin thuas fiú is go raibh a fhios ag Seán Tadhg Ó Gairbhí go raibh blás bréagach leis. Chomh fada agus a bhaineann sé leis an Ghaeilge, níl an chriochdheighilt abharach cé go dtuigim cén fath go mbeadh meoin aigne iar eagarthóra Foinse go fóill srianta ag an meoin aigne seo. Nó nach é sin an t-aon dea rud atá le baint as bunú Fhoras na Gaeilge mar chuid d’fhoras teanga uile Éireann? Bíodh is nach institiúid foirfe an Fhoras – agus nach mise atá carthannach! – is ar bhonn uile Eireann ar cheart a bheith ag déanamh riar ar an nGaeilge. Bhí Foinse beo ar an gcriochdheighilt. Gan an chriochdheighilt ní bheadh sé tagtha ar an saol fiú. Roghnaigh Bórd na Gaeilge iarratas Mhoinéar Teoranta thar iarratas Lá, a bhíodh ag foilsiú go seachtainiúil i 1996, agus b’é an údar ba mhó lena rogha, dar liom, go raibh Moinéar Teo chun an nuachtán a bhí siad ag moladh a lonnú sa Ghaeltacht agus go raibh Lá bunaithe ó thuaidh agus nár mhaith leo airgead an ‘Stáit’ a chur as an Stát fiú is go mbeadh luach níos fearr le fáil ar an airgead ó thuaidh nó ó dheas. I gcaitheamh na mblianta, bheathaigh an criochdheighilt céanna Foinse go maith le h-ais Lá agus Lá Nua. Mar a dúirt Pádraig Ó Céidigh agus é ag fógairt bhás an nuachtáin ar TG4, costas €1m in aghaidh na bliana a bhí air an nuachtán a fhoilsiú. Fuair Moinéar Teo €300,000 ó Fhoras na Gaeilge agus fograíocht ó na h-údaráis arbh fhiú €750,000 air. Ní le Foinse a cháineadh atáim ach le féachaint anois ar an dtírdhreach agus cad tá romhainn. Bhí litir san Irish Times inné agus é sínithe ag go leor de mhaithe agus de mhór uaisle na Gaeilge. Ainmneacha na nGaeil Móra ón deisceart is mó a bhí le braistint ann – ach bhí a n-achainí iar bháis ró mhall do Foinse. Nior aithníodh sa litir gurbh ann dó An Druma Mór/Nuacht 24 agus deineadh beag den obair atá á dhéanamh ar an idirlíon. A chara, – We wish to add our voices to the others which have deplored the closure of the weekly Irish language newspaper, Foinse. It was an invaluable source of information, opinion and linguistic refreshment for those of us who wish to keep the Irish-speaking part of our reading brains active in a sea of English language print media. Where else will the voices of the talented team of journalists and columnists employed by Foinse reach their audience? How else will the community of interest which straddles Gaeltacht and non-Irish speaking areas of the island read each others’ stories in print? Where will the young school-going readers of Foinse go for the invaluable assistance they’ve had for their Junior and Leaving Cert Irish exams? A linguistic community that does not have regular access to printed material is the weaker for its absence. Of course speakers of Irish listen to radio, watch TV and use the internet, Facebook, Twitter and so on, just as English speakers do. But a tangible piece of print like a weekly newspaper helps to enrich our knowledge of the written language, while keeping us well informed. The closing of Foinse is a loss for journalism in Ireland. It is well documented by those who have researched the area of language revival that a journalistic forum is central to creating a living language, a forum which is now coming of age after 100 years of national Irish language newspapers. We appeal to all parties involved and to those who have the power to intervene to revisit the decision and to search for new ways of supporting this valuable resource. Cuid de na daoine a shínigh an litir, bionn siad ag obair le RTÉ, an craoltóir céanna atá tar éis cliseadh go h-iomlán ar a dhualgaisí reachtúla i leith na Gaeilge. An peaca is mó orthu san go bhfuil an craoltóír ag séanadh ‘fóram náisiúnta’ ar lucht na Gaeilge. Tugaim faoi ndeara na tagairtí atá sa litir seo ‘in print’ agus ‘tangible’. Tá daoine ann den tuairim gur cheart cloí leis an sean mhúnla fiú is go bhfuil sé cruthaithe nach n-oibríonn sé. Dá mbeadh an dream a chuir a n-ainmneacha leis an litir seo sásta an nuachtán nua seo a bhunú iad féin, beart a dhéanamh de réir briathar, bheadh níos mó measa agam orthu. Ag an am seo, tuigtear nó tá sé ráite, go bhfuil Foras na Gaeilge ag ullmhú chun comórtas eile a fhógairt. Ceapann an Fhoras, is cosúil, go bhfuil dreamanna eile amuigh ansan sásta tabhairt faoin obair seo. B’fheidir go gcuirfidh Ó Céidigh isteach ar an gcomórtas arís ag súil go mbeidh tairiscint níos fearr ann an dara uair de bharr brú ón bpobal. Bhuel, má tá sé ag brath ar chúpla litir san Irish Times ó na maithe is mór uaisle an taoide a athrú ar a shon trath go bhfuil an tóin ag titim as an ngeilleagar, tá dul amú air. I bhfianaise na cainte atá déanta faoi mholtaí Bórd Snip, agus trácht ann faoi dhúnadh nó ‘athmhunlú’ Roinn Ghnóthaí Pobail, Tuaithe agus Gaeltachta Uí Chuív, ní feidir brath ar an gcriochdheighilt fiú le h-aghaidh an slánú. Gan amhras, dá mbeadh ciall ag an bhForas, lorgóidís cruinniú le Nuacht 24 agus dhéanfaidís socrú leis an nuachtán sin fógraí rialta a fhoilsiú sa nuachtán sin chun a thodhchaí a chinntiú. Ní gá comórtas phoiblí chuige seo agus d’fhéadfaí tacaíocht substaintiúil a threorú chuig an nuachtán sa tslí sin. Cuimhnigh gur thug Foras na Gaeilge €65,000 don Sunday Indo anuraidh chun CD a scaipeadh – agus an raibh comórtas phoiblí ann don obair seo? Ní raibh ná baol air. Go fóill ní fhaca mé fogra ó Fhoras na Gaeilge i Nuacht 24. Anois tá athrú ar an scéal nó, in eagrán na seachtaine seo de Nuacht 24, d’fhograíodh gurb é Nuacht 24 an t-aon iarratas atá fagtha sa chomórtas le h-aghaidh an conradh do sheirbhís nuachta ar líne fhísiúil a bhí á reachtáil ag an gCiste Craoltóireachta. In áit cloí leis an gcur-chuige criochdheighilteach amaideach agus mí éifeachtach a chloígh siad leis i gcaitheamh na mblianta, agus a theip orthu arís is arís eile (de bharr laigí an Fhorais), ba cheart dul i bpáirt le Nuacht 24, an t-aon imreoir atá fagtha ar an mbloc, an imreoir amháin a léirigh inmharthanacht i gcaitheamh na mblianta agus é faoi éide Lá/Lá Nua roimhe seo. Ní h-amháin sin – ach is acu atá seilbh na liathróide…. Níl sé ciallmhar ag an bpointe seo cloí leis an múnla cló. Tá comhreiteach aimsithe ag Nuacht 24 atá sasúil domsa – agus a bhí á mholadh agam do Lá Nua roimhe seo, go mbeadh leagan cló á sheoladh sa phost do dhaoine ar mhaith leo an nuachtán a bhraistint ina lámha. Sasaíonn an eagrán cló sin riachtanas na scoláirí a bhí ag fáil Foinse agus Lá Nua tríd an phost roimhe seo fiú. In áit leagan costas leagan chló a iompar, bheadh sé níos saoire don Fhoras deontas 50% a chur ar fáil do leitheoirí nuachtáin Ghaeilge chun gléas ar nós an Kindle a cheannach chun go mbeadh siad ábalta é a iompar is a bhreith leo. Ní gá gurb é seo an reiteach – nílim ach ag iarraidh tuairimí nua a chur ós bhúr gcomhair agus bhúr mbarúlacha a aimsiú. Tá sé in am tabhairt faoin dúshlán seo i gceart. Bheadh sé go deas mar athrú! Foilsiú: 04/07/2009 . igaeilge a d’fhoilsigh. Ranganna: An Ghaeilge, Cúrsaí Reatha. Clibeanna: An Druma Mór, Ciste Craoltóireachta na Gaeilge, Foinse, Foras na Gaeilge, Irish Times, Nuacht 24, RTÉ. Is cosúil go bhfuil duine eigean ag éisteacht liom amuigh ansin. Seo mar a dúirt mé cúpla seachtain ó shin agus mé ag tracht ar dhá shuíomh Ghaeilge a bhí bunaithe ag an BBC ar an idirlíon. Ar aon nós tá moladh ag dul don BBC, agus ní minic a chloisfidh tú na focail sin ó mo bhéal, as ucht suíomh d’ard chaighdeán mar seo a chur ar an líon. Tá tréan mholadh ag dul do Antaine agus a chomhleacaithe as a gcuid saothair agus feabhas an ábhair. Níl an suíomh gan locht. Tá easnamh mór amháin le mothú ann agus is gá seo a lua i gcomhthéacs an ráitis ag Antaine atá luaite ar Tuarascáíl. Dúirt léiritheoir feidhmiúcháin Aonad na Gaeilge sa BBC i mBéal Feirste, Antaine Ó Donnaile, go mbeadh, “den chéad uair, gach rud a rinne BBC Thuaisceart Éireann i nGaeilge” le fáil ar an suíomh ach cóipcheart a ghlanadh. Tá sé sin cruinn gan amhras. An rud atá ar iarraidh, áfach, ná seirbhís nuachta agus anailíse ar chúrsaí reatha, mar atá ar fáil don Bhreatnais sa Bhreatain Bheag. Tá fógra déanta inniu a fhéadfadh tús a chur le ré nua amach is amach i saol na h-iriseoireachta Ghaeilge. D’fhogair Ciste Craoltóíreachta na Gaeilge sna sé chontae, ciste a throid mé go tréan ar son a bhunaithe agus á cosaint nuair a tháinig sé faoi íonsaí, go raibh tairiscintí á lorg le h-aghaidh seirbhís nuachta/cúrsaí reatha digiteach ar líne. Sa deireadh thiar táimíd ag féachaint chun tosaigh agus ag beartú i dtreo seirbhis úr a bheadh ar ard chaighdeán. Tá na bunchlocha ann – An Druma Mór agus an fhoireann cumasach atá ar a chúl. Mas é seo an rud ar feidir leis an bhfoireann sin déanamh gan airgead, cad is feidir leis an dream céanna déanamh le h-airgead. Cinnte tá gá le snás a chur ar an suíomh, an oiread is go bhfuil gá le snás a chur ar suíomh ar bith, iGaeilge san áireamh, agus beidh gá le roinnt saineolais chun sin a bhaint amach, struchtúr suímh a bheadh inchurtha leis an seirbhís seo a chur in áit. Ach ina dhiaidh sin, is dúthracht agus cur chuige agus tiomáinteas atá ag teastáil. Fiú is go bhfuil moladh ag dul don Chiste Craoltóireachta as ucht an beartas seo a fhógairt, tá gá freisin a aithint gur cheart go mbeadh cibé seirbhís a bhunaítear in ann a bheith inmharthanach tar éis a thagann deireadh le tacaíocht an chiste, nó is cinnte go dtiocfaidh deireadh leis luath nó mall. Faoi mar atá sé níl aon chinnteacht go mairfidh an chiste thar 2011. Molaimse mar sin go mbeadh feachtas ann chun sciaranna a cheannach ina leitheid de thogra le go mbeadh úineireacht ag pobal na Gaeilge air, fíor sciaranna le fíor cearta sciar shealbhóirí le fíor freagracht is fíor úinéireacht. Mar a thairg mé roimhe táim sásta €1,000 a chur sa phota sin agus tugaim cuireadh do dhaoine eile ar suim leo an togra seo amhlaidh a dhéanamh Íocfaidh mé méid áirithe in aghaidh na míosa ar son a leitheid de sheirbhís – abraimís costas an Irish Times gach lá ar feadh míosa maraon le nuachtán Domhnaigh – sin €40 agus leanfaidh mé sin ar feadh dhá bhliain. Má dheineann 130 duine/eagras é sin, beidh dúbailt an infheistíocht ag an dream a bhuafaidh an comórtas seo chun brú ar aghaidh leis an togra. Dhíolfadh sé as an dara bliain den seirbhís. Seo in am do Ghaeil na tíre a chruthú go bhfuilimíd in ann ag an dúshlán. Ná bímís inár gcaoire ag feitheamh le féar a fhás – cuirimís na síolta agus bainimís an Fhómhar. Foilsiú: 19/03/2009 . igaeilge a d’fhoilsigh. Ranganna: An Ghaeilge, Cúrsaí Reatha, Cultúr, Nuacht. Clibeanna: Ciste Craoltóireachta na Gaeilge, Nuacht Sheirbhis Laethúil Ghaeilge. Dhá shuíomh Ghaeilge ón BBC ar lá amháin…. Bionn tú ag fánacht na mblianta ar son suíomh Ghaeilge ar an mBBC – agus ansan foilsítear dhá shuíomh ag an am amháin! Ní miste – nó is dea scéal ar fad é go bhfuil an dhá shuíomh ann, leathnach Ghaeilge nua an BBC féin i dtuaisceart na hÉireann, agus Preab Suas, suíomh nua dírithe ar lucht imeartha na peile Gaelaí. Ar chúis éigean níl teacht ar an suíomh sin go fóill – ach tá sé ar shuíomhanna an BBC in áit éigean. Nior luaigh Pól Ó Muirí é ina thuairisc ach ní cinealtas croí a tháinig an dhá shuíomh seo ón BBC. Dá fheabhas is dá threise iad Aonad na Gaeilge san BBC – agus tá ard mheas agam ar Antaine Ó Donaile, Lynette Fay, Tomaí Ó Conghaile agus a gcomh leacaithe – ní bheadh na suíomhanna seo ann ach amháin deontas a bheith tugtha don BBC ag an gCiste Craoltóireachta Ghaeilge. Agus ní bheadh an Chiste Craoltóireachta Ghaeilge ann ach an dian fheachtas leanúnach fhadalach a bhí ar bun ag gniomhaithe ar nós Gearóid Ó Cairealláin is a thuilleadh nach iad, lena bplacairdí, ‘Auntie Beeb is Anti-Irish’, i gcaitheamh na mblianta. B’fheachtais iad seo ar thug leithéidí an BBC agus an Irish Times droim láimhe dóibh agus nár thug súntas dá laghad dóibh. Dar le na meáin measúla seo, agus, is cosuil, an dá rialtas, ní raibh an Ghaeilge ach ina aguisin sna comhaontaithe pholatúla a deineadh le blianta beaga anuas. Ní gá filleadh, arís, ar an bpriacal ina raibh an Chiste anuraidh de bharr íonsaí an DUP (agus faillí Shinn Féin is an SDLP) agus an slí a náirigh Lá Nua SF chun brú a chur ar Gordon Brown an chiste a chur ar nais in ainneoin an DUP. Ní gá ach a rá gur rud é an chiste seo a saothraíodh le h-iarracht leanúnach agus le h-íbirtí agus nár cheart é a gheilleadh go h-éasca. Cén fath nach féidir leis an BBC i mBéal Feirste a leitheid de sheirbhís a chur ar fáil ar an suíomh nuachta atá acu féin? Foilsiú: 04/03/2009 . igaeilge a d’fhoilsigh. Ranganna: An Ghaeilge, Cúrsaí Reatha, Cultúr, Nuacht. Clibeanna: An Bhreatain Bheag, an DUP, BBC Thuaisceart na hÉireann, Breatnais, Ciste Craoltóireachta na Gaeilge, SDLP, SF. An DUP ró mhaith do Shinn Féin ó thuaidh…. Thug Margaret Ritchie, Aire Fhorbartha Shoisialta an Tuaiscirt, léargas speisiúil ar an mbealach atá Feidhmeannas an Tuaiscirt ag feidhmiú agus í ag labhairt ag an gComhdháil Bhliantúil a reachtáil an SDLP ag an deireadh seachtaine in Ard Mhacha. The DUP was “running the show and running rings round Sinn Féin. Sinn Féin are not able for them,” she added. The Executive was moving ahead entirely on a DUP agenda, she said. Is dócha go mbeifeá ag súil lena leitheid ó bean an SDLP – agus ní gá a rá go bhfuil sise ina ball den Fheidhmeannas céanna agus má tá an DUP ag déanamh beag de Sinn Féin is dócha gur cloch níos lú fós ar a paidrín í Margaret Ritchie. Táim den bharúil go bhfuil blas den fhirinne sa mhéid a deir Ritchie, a chruthaigh a dintiúirí nuair a ghearr sí an maoiniú ar ghrúpaí le ceangal leis an UDA, fiú más amhlaidh gur eirigh le dúshlán dlíthiúíl in éadan an chinnidh seo, mar go bhfuil an fianaise le feiscint go soiléir. Bhí sé le feiscint go soiléir nuair a chinn Edwin Poots fáil reidh leis an gCiste Craoltóireachta Ghaeilge le linn a réimeas ag an Aireacht Chultúr, Ealaíon is Foillíochta. Ach amháin idir ghabhail phobal na Gaeilge ar an gceist sin, idirghabhail a fuair ardán i Lá Nua, nuachtán laethúil na Gaeilge, an mbeadh Gerry Adams tar éis an ceist a thogáil agus é ag iarraidh luach saothair éigean dá pháirtí ón mhion eigeandáil a bhí ann i mI Bealtaine? Caol seans. Ar an droch uair, áfach, ní raibh sa mhéid a fuair Gerry Adams ó Gordon Brown ach a dhothain chun dhá bhliain eile den gCiste a mhaoiniú agus níl aon bannaí ann faoi thodhchaí fhad treimhseach an Chiste. In áít bheith ag fánúint san áit a raibh sé, ag £3m in aghaidh na bliana, ba cheart go mbeadh an Chiste seo á mhaoiniú ag an libhéal céanna is atá cistí cosúil leis in Albain agus An Bhreatain Bheag. Níl bric ar bhric ag suíomh na Ceise Fada, ní fios an mbeidh réiteach riamh ar an leamhsháinn faoi dheireadh a chur leis an 11+ agus an córas míchothrom a bhuanaigh an scrúdú uafásach sin, tá an Cheathrú Gaeltachta siocaithe go fóill agus na céadta milliún á gheallúint do Cheathrú an Titanic is eile. An bhfuil aon rud á dhéanamh sa cheart ag Sinn Féin? Agus mas amhlaidh nach bhfuil, cé ar cheart a chur san áit a bhfuil Sinn Féin anois? An SDLP – ar eigean é.
Foilsiú: 26/01/2009 . igaeilge a d’fhoilsigh. Ranganna: An Ghaeilge, Cúrsaí Reatha, Cultúr, Nuacht. Clibeanna: Ciste Craoltóireachta na Gaeilge, DUP, Edwin Poots, Margaret Ritchie, SDLP, Sinn Féin. Mo cheol thú, ‘Faoi Lán Cheoil’! Caithfidh mé a admháil gur mó uair a dúirt mé liom féin go raibh i bhfad an iomarca cláracha ceoil, cheapas, ar TG4. Ní h-é nach dtaitníonn ceol traidisiúnta liom – nó taithníonn sé liom go mór – ach uaireannta ní bhionn sé chomh speisiúil sin bheith ag faire ar a leitheid de chlár ar an dteilifís. Ar aon nós, seo linn go dtí abhar an lae. Os rud é go raibh ana chuid Béarla san eagrán seo de “Faoi Lán Cheoil” agus go mbaineann sé le fear ag foghlaim conas poirt a sheinnt ar an bhfidil [Reality TV – cúis eile chun an clár a dhí mholadh], bhíos den tuairim nach dtaithneodh sé liom ar chorr ar bith. Ach a mhalairt glan atá fíor. D’eirigh leis an eagrán inar fhoghlaim an sar aisteoir scannáin, Jeremy Irons, a bhuaigh Oscar roinnt mhaith blian ó shin, conas an fhidil a sheinnt i seisiún ceoil imeacht i bhfeidhm orm go mór. Clár an-phleisiúrtha a bhí ann le fáire air agus le h-eisteacht leis. Bhí sé suite idir iarthar Chorcaí, áit atá caislean ag Irons láimh le Dún na Séad, agus i Nua Mheicsiceo, mar a bhí Irons ag scannánaíocht ar scannán a bheidh le feiscint, amach anseo, ar ‘Western an Aoine’, Appaloosa. Ar aon nós bhí draíocht eigean ag baint leis an gclár – cumas grinn Irons agus a nadúrthacht os comhair an cheamra, foighid an mhúinteora, Caoimhín, agus an radharcra alainn idir iarthar Chorcaí agus iarthar Mheirceá, a mheall mé, a shuaimhnigh mé agus a shasaigh mé. An sprioc a bhí ag an múinteoir agus ag an dalta, seinnt le cheile ag Aonach na bhFidil i nDún na Séad san Fhómhair, rud a rinne siad agus cé a bhí ag seinnt leo ach Martin Hayes, Breandán O Beaglaoich agus Dennis Cahill, triúr de mhór cheoltóirí na tíre. Má bhí Irons abalta seinnt leo is cinnte go mbeadh sé abalta an fód a sheasamh in áit ar bith sa tir, fiú ag seisiún i Sraid na Cathrach le linn seachtain Willie Clancy. Ar aon nós ní doigh liom go bhfuilim ag scaoileadh rún má dheirim go raibh crioch sona ceolmhar leis an gclár a léirigh Conor O’Byrne, sár cheoltóir é féin, ar son Stirling Productions i mBéal Feirste agus a fuair tacaíocht ón Chiste Craoltóireachta ó thuaidh. Foilsiú: 27/11/2008 . igaeilge a d’fhoilsigh. Ranganna: An Ghaeilge, Cultúr. 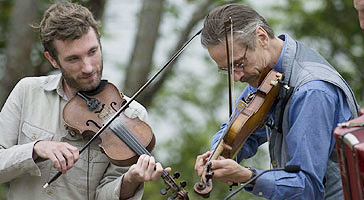 Clibeanna: Ceol traidisiúnta, Ciste Craoltóireachta na Gaeilge, Jeremy Irons, Martin Hayes, TG4.